Click here for all the pix from Day 4. The students had the final test session this morning at 8 am. But I am not a student, so I was able to sleep in a bit. I got my large coffee and headed to the Certamen Semifinals. All the OH teams did well, but none progressed to the Finals. The Novice team raced off to a quick lead by taking the first 2 questions, but it was all MA and VA from there. MA sealed the victory with a correct answer on the 19th question. The Intermediate team also got the first 2 questions of their round, but then TX took control with 7 of the next 10 questions. 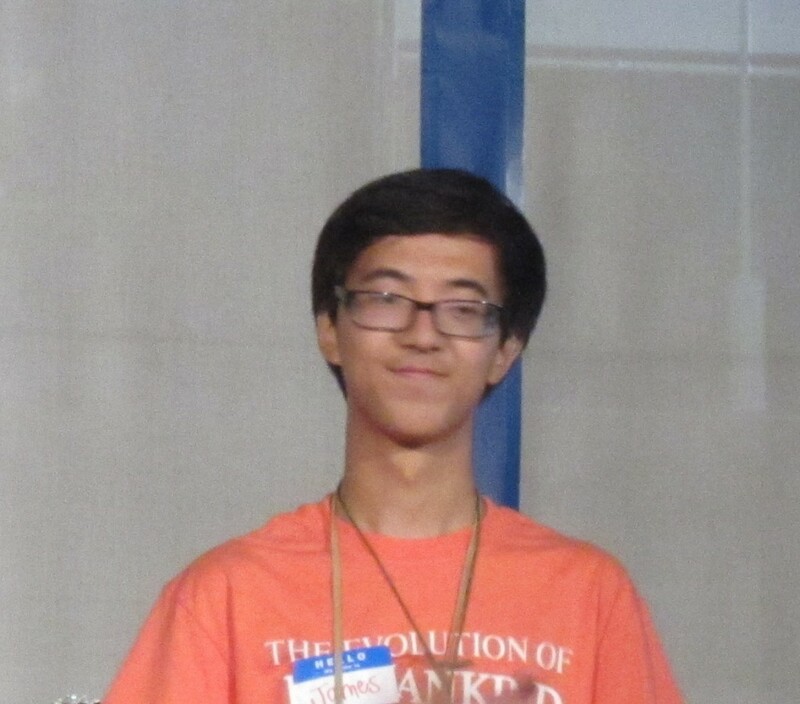 I was unable to watch the Advanced team b/c their round was the same time as the Novice Semis. But all reports indicate they were competitive but came up short against the MA team. 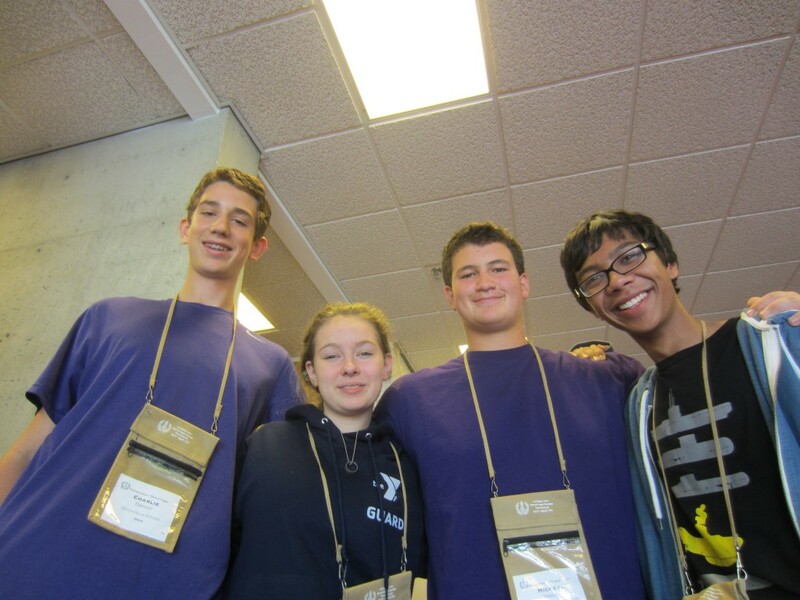 This is the last JCL certamen competition for Tino Delamerced, formerly of Summit and on his way to join his big sister Anna at Brown University. Tino has been a great example for all the players and has shown grace in both victory and defeat. He has mentored the younger students well and will be sorely missed. After a (very quick) lunch, all states had their caucuses to select the candidates who would receive their votes for national office. Parliamentarian Tullus Dean did a great job running the OH caucus. The process is very rigid and filled with motions & procedures, but Tullus navigated the electoral waters well. During the caucus, delegates are able to voice their opinion about why the state should (or should not) vote for a particular candidate. I am always impressed how seriously the students take this responsibility. It was not a popularity contest but rather a real debate about the platforms of the candidates. Go Democracy! Tullus sets forth the rules for the discussion. During the caucus, Julia Dean and Caroline Kubicki (both of Summit) were informed that their costume earned a ‘Best of Show’ award. Not only did they earn 1st place for their age group, but they also get the privilege of presenting their costume on stage during the Awards Ceremony tomorrow morning. The proud father will be sure to get some pix of the big event! 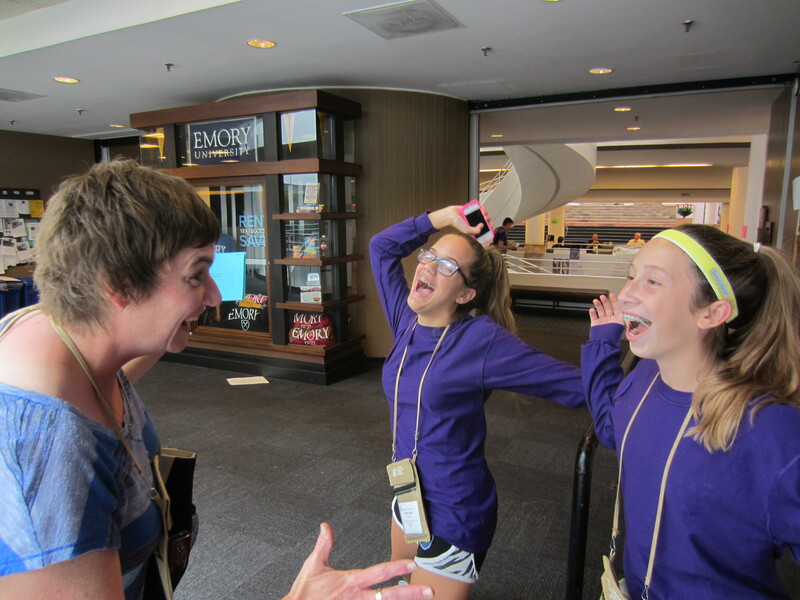 Amy Elifrits – NJCL Committee Chair and the most powerful person at convention – informs Caroline & Julia about their big award. During the casting of the ballots, there is always a choral performance by JCLers. 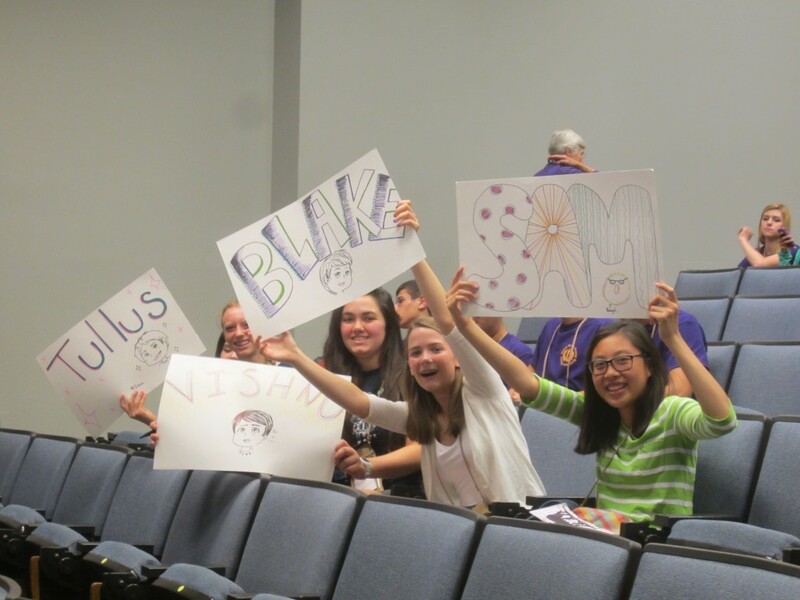 There were some OH kids in the group, not sure exactly who, but I know that 2 were from Wellington b/c I saw Mrs. I go take a picture. 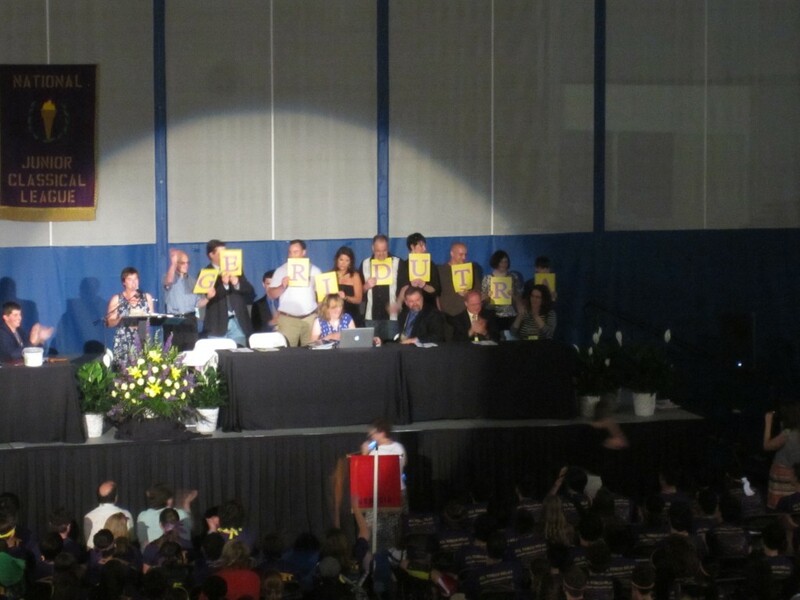 The TX delegation did a presentation in which everyone was invited to next year’s convention: July 27 – August 1, 2015 at Trinity University (San Antonio TX). GA 4 is always the time when long-time attendees are recognized. About one-third of the students are 1st timers. Tullus is at 3. This is my 16th convention – 1 as a students in 1985 and 15 as a teacher. Brian Compton is over 20 years. Sherwin Little is over 30 years. 2 teachers were honored with a Silver Tray for their 40th convention. 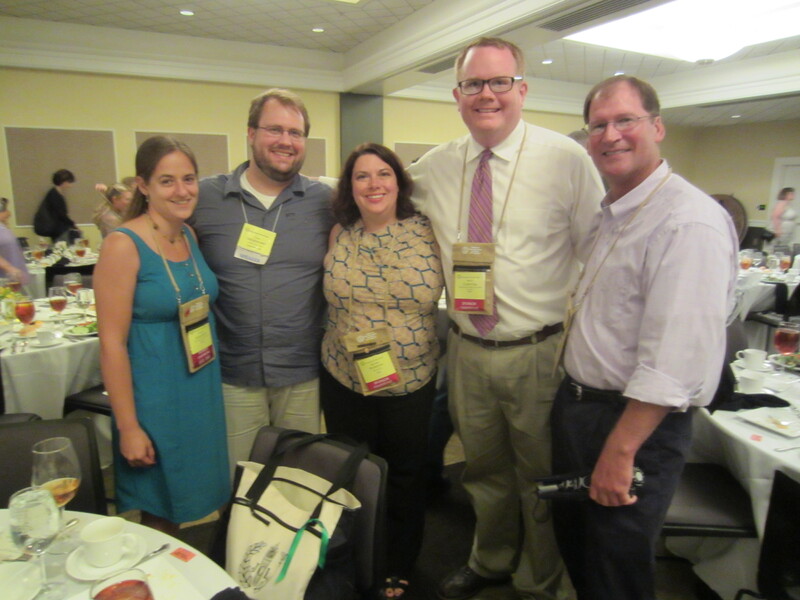 And Susan Shearer of VA has attended over 50 – more than a year of her life at the NJCL! 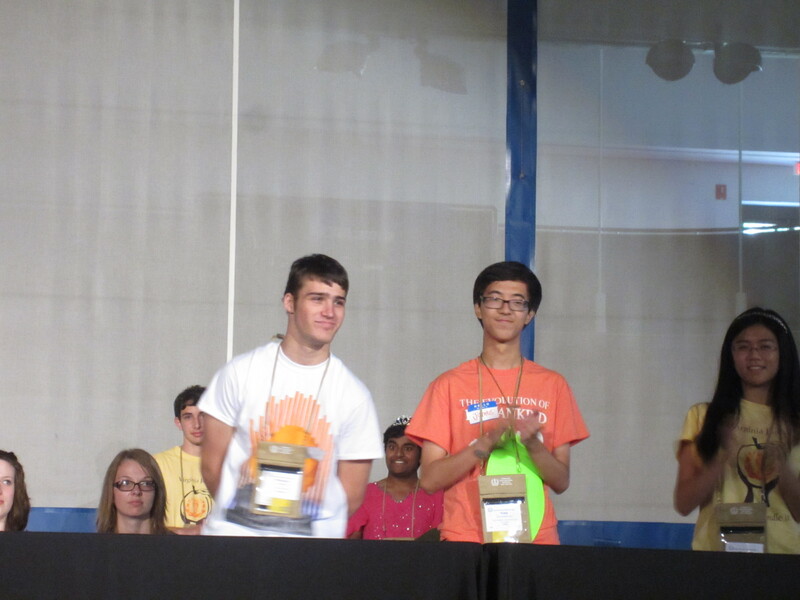 As expected, Narayan Sundararajan of Shaker was elected as the 2014-2015 NJCL 2nd Vice-President. He was very excited and pleased by the announcement, and during the late-night fellowship the new national officer was asleep in his chair. Click here for a 2 minute video of OH spirit at GA 4. Lastly, GA 4 honored NJCL Adminstrator Geri Dutra for her 31 years of dedicated service to the organization. Geri is retiring this year. She was very surprised during the presentation b/c her entire family came down to Emory to be there for her. They are the ones holding the placards with her name spelled out. We will miss you, Geri! Geri Dutra is honored for her service to the NJCL. During the rain, there was the annual picnic for the teachers and chaperones. Melissa was at my table, so I don’t need to describe my meal except to say that it was tasty. Most of the OH teachers were at 1 table. OH rox. Emelie (aka Mrs. I), Todd, Melissa, Brian, Larry – Dan Cavoli & Steve Gentle disappeared before the picture. 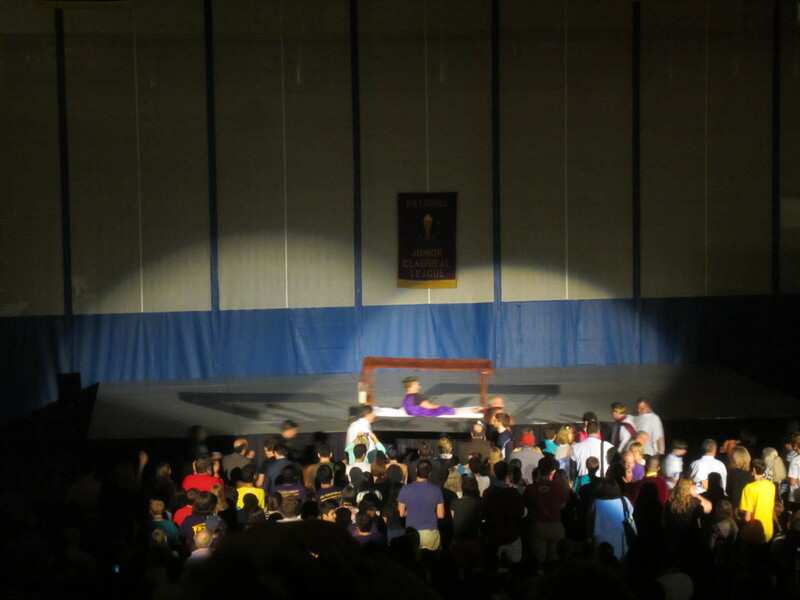 After the banquet for teachers and chaperones was ‘That’s Entertainment.’ This event is planned by the Omniscient, Omnipotent, Omnipresent, Indispensable SCL, the college students who return to convention each summer. [During the rest of the week, the SCLers organize and serve as referees for the athletics (Ludi and Olympika).] 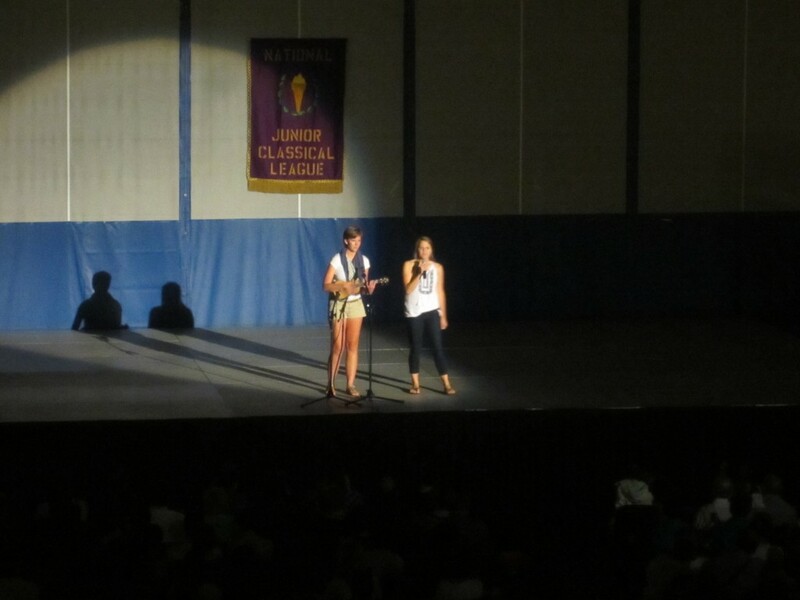 JCLers audition earlier in the week to get on stage during this 2 hour talent-and-variety show. 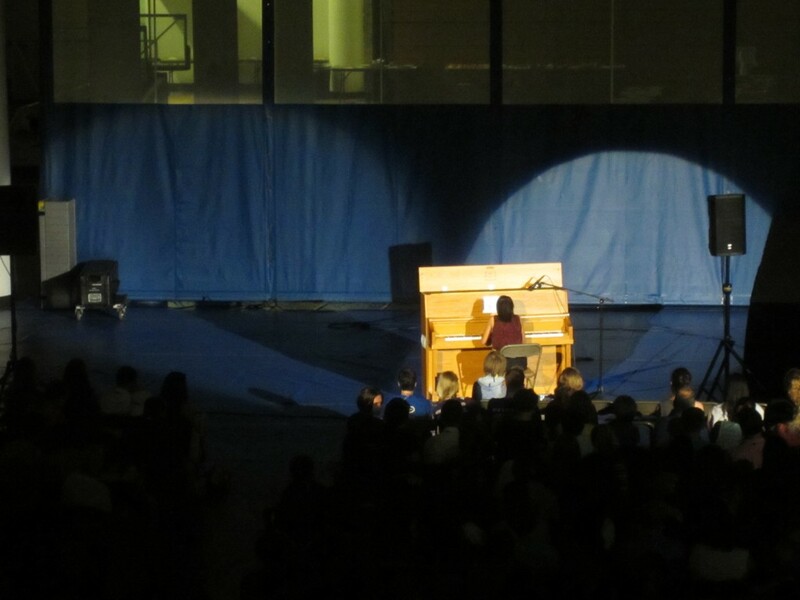 4 OH students performed: Emily Brown & Lindsey Dierig (an original song), Tino Delamerced (piano medley), Allison Kao (classical piano), and Emily Haussler (ballet). 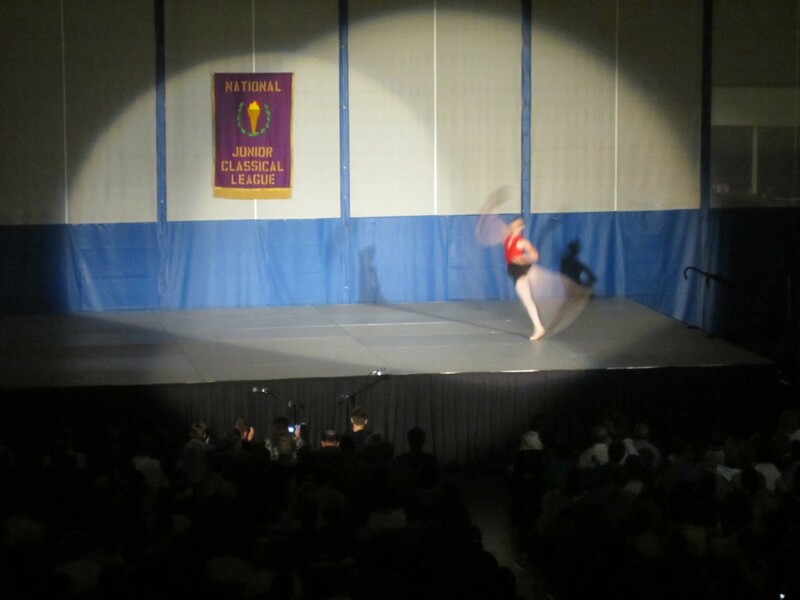 ‘Empress’ Geri Dutra began the show. She was carried in on a litter and escorted by toga-clad members of the National Committee (including Amy and Melissa). Certamen was featured in a skit – World Cup style, including a bite on the arm by a Zombie player from South America. A number of OH SCLers had a part in the show: Maddie Briner, Bobby McDonald, Bri Forney, Mollie Effler, Heather Smith, and probably some others who are now mad at me for forgetting them. At fellowship, Allison and Emily – on behalf of all the performers – thanked the OH students for their enthusiastic support during the show. And, of course, the Racketeers made an appearance to close the show. 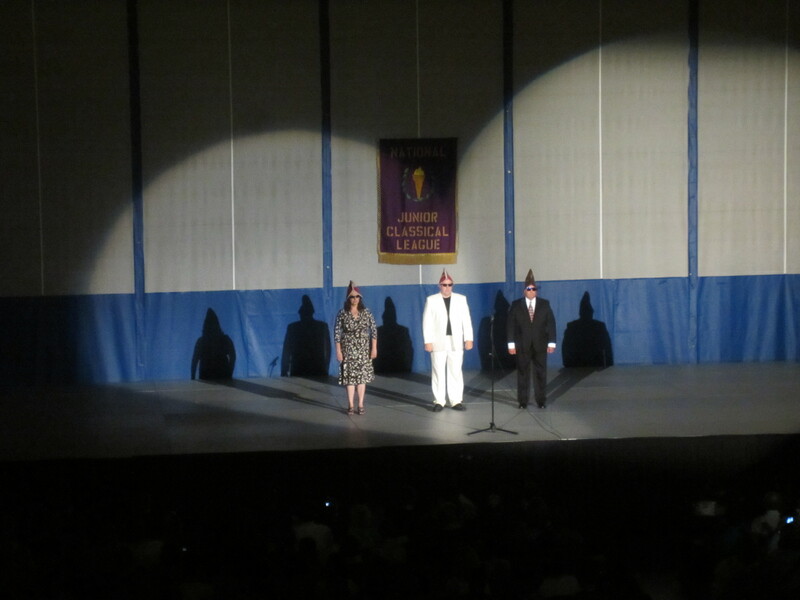 These 3 mysterious, well-dressed, unsmiling, tennis-covers-as-hats performers are a mainstay of the event. The climax of their minimalist brand of entertainment was their interpretation of ‘What Does the Fox Say.’ I am still not sure was the fox is actually saying, but the Racketeers gave me some very tiny morsels of food for thought. Empress Geri Dutra makes her entrance. 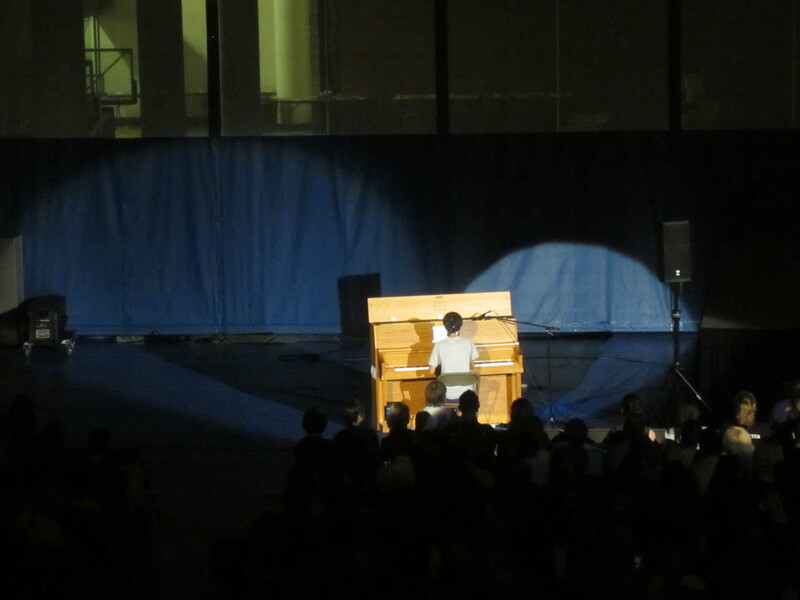 Tino enthralls the crowd with his original composition. Emily & Lindsey tell the unfortunate tale of dad-killing, mom-marrying Oedipus. Emily’s swift yet elegant movements elude the focus of the camera. Allison’s playing alternated between mesmerizing and frenetic. A rare photo of the Racketeers in their natural habitat.